Students in Dr. Vore’s 1st period Anatomy class have enjoyed a number of labs this school year. His students have worked with microscopes a number of times and have interacted with the class skeleton, Josephine, and other bone samples. The anatomy students are currently learning about the skeletal system. 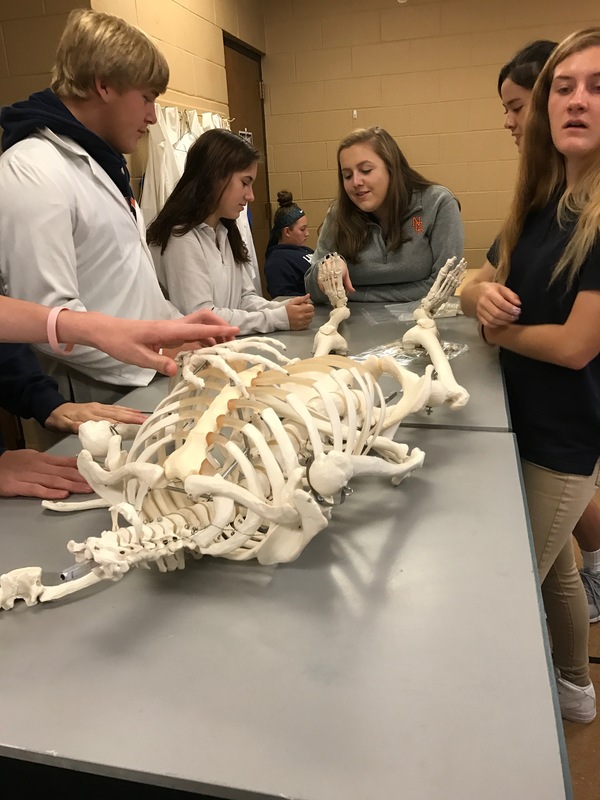 Because Dr. Vore supports hands-on learning techniques, his students have been able to spend class walking around the room, observing the different bones of the body. The samples are life-like and give a very accurate visual representation of the bones found in a human skeleton. His students are loving these hands-on labs. Hampton Taron, a junior, said “I’m a visual learner so the labs really help me see where all the bones are located.” These labs have allowed her to see the bone structure more clearly than the pictures drawn in the textbook. Nothing beats the 3D visuals that come with observing actual bone models. Junior Emmie Kate Boucher said, “The labs are very fun and help us get a better understanding of the human body.” The other students agree with her statement. The 1st period class is full of laughter as well as learning. For instance, the class skeleton was going to be named Napoleon Bonaparte (bone-apart), but since it is a female skeleton, the class decided to nickname her Josephine after Bonaparte’s wife. In August, when the class was studying cells, Dr. Vore allowed them to look at different microscope slides in order to understand the organizational pattern of different cells found in different organs. This prompted a better understand of cell structure for the students. The textbook can only provide pictures, whereas the microscope allows students to move the slide around, focus on the image, and zoom in and out for a more complete understanding of the structure. While the students have already done a number of labs, there are many more on the horizon. This should be an exciting year for his students.